Why was the home foreclosed in the first place? Also keep in mind that if a homeowner is not paying their mortgage, chances are that they are not paying for repairs or maintenance either. Hire, a certified home inspector before placing a bid on a property so that you know how much to offer and don’t end up with unexpected repairs that are not budgeted for. At A-Pro we take out the guesswork. Our “CHI” certified home inspectors will help you make a wise decision so that you and your investment is protected. Our inspectors are licensed, insured and bonded and stand behind their work with a 120-day ironclad “if we don’t report it, we repair it” guarantee. That way, you the real estate agent and everyone is protected. 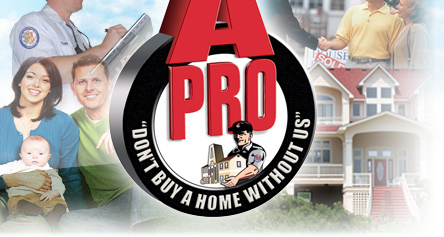 Be smart, be protected, have your foreclosure home A-Pro inspected. This entry was posted on Thursday, July 19th, 2012 at 1:07 pm	and is filed under Top Salt Lake City Real Estate Agents. You can follow any responses to this entry through the RSS 2.0 feed. Both comments and pings are currently closed.